Family members of workers inside CVE Technology in Allen, Texas, took concerned phone calls, sent worried texts and waited for updates throughout the afternoon while ICE conducted raid operations. Katrina Berger, Homeland Security Investigations Special Agent in Charge, during a press conference in Irving, Texas, on Wednesday, April 3, 2019. Buses, at least one of which said LaSalle Corrections Transport, left CVE a few hours after the raid began, presumably with undocumented workers inside. Some demonstrators yelled toward one of the buses, "We see you, we love you." Employees of CVE Technology in Allen who walked outside the building during the raid carried their personal possessions in a zippered plastic bag. Family of employees inside CVE Technology Group in Allen, Texas, gather outside the building, where the ICE operation is taking place. The Allen Police Department helped facilitate the immigration raid at CVE Technology. Demonstrators with signs gathered outside CVE Technology in Allen during the ICE raid. The morning raid in the Collin County city of Allen, 20 miles northeast of Dallas, came after an investigation into CVE Technology Group, which refurbishes and repairs cellphones and other consumer electronics. Hiring irregularities found during an audit of the company's I-9 forms confirmed those tips. CVE hasn't responded to media requests for comment. Businesses that knowingly hire undocumented workers “create an atmosphere poised for exploiting an illegal workforce,” Berger said. CVE employee Yessenia Ponce was inside the building when agents arrived. In the past year, North Texas has been the site of the two largest single-site workplace raids in the U.S. in the last decade. Prior to Wednesday's raid in Allen, the largest raid took took place in the small Northeast Texas town of Sumner at a trailer manufacturer, where 159 undocumented workers were arrested. The largest workplace raid to ever take place in the U.S. was in Postville, Iowa, in 2008, where almost 400 people were arrested. Late Wednesday morning, workers inside the CVE building in Allen began texting and calling family members, alerting them that officers were on site. Nervous relatives raced to Allen, waiting for information. One got a text from his wife, who asked him to call an attorney. Maria Soria waited for news about her mother, Socorro Lechuga, a CVE employee for about six years. 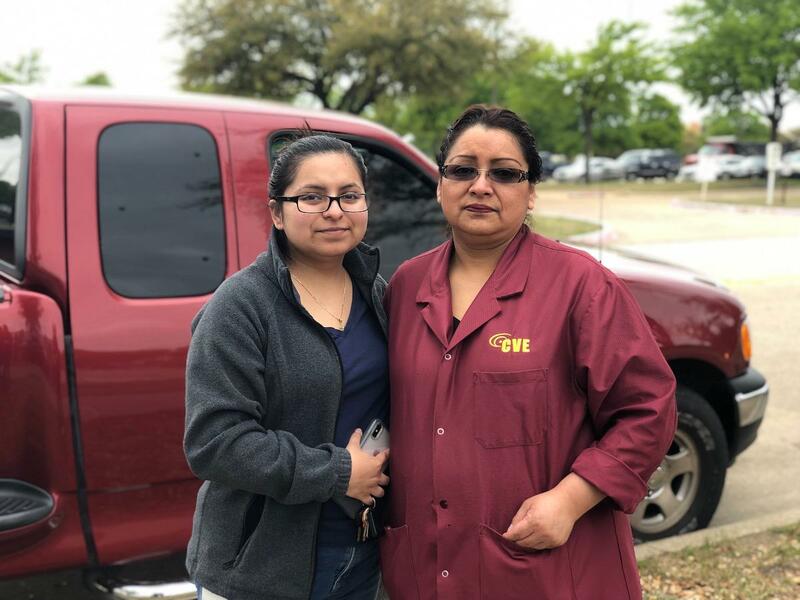 Around 10 a.m. Wednesday, Soria got a voicemail from her mother saying that ICE agents had arrived at the company and that she didn't "know what's going to happen." The message made Soria cry. "I was worried at first, because you hear 'ICE' and everything goes downhill," Soria said. She left work in Las Colinas to make the 30-minute drive to Allen. Socorro Lechuga (right) who's worked for CVE Technology Group for around six years, was released by ICE agents conducting a raid at the company. Maria Soria (left) came from Las Colinas to be with her mother. Soria said her mother already had a petition for legalization in place before the raid. Lechuga is originally from Guerrero, Mexico. She called her mother's lawyer, who told her not to worry. "They can't do anything to her, pretty much, because she does have a petition in place," Soria said. "So that gave me a peace of mind, that at least I know my mom will be OK," Soria said. "As far anyone else here, I really don't know their status or their situation, so that's a whole different story." Lechuga, 46, was eventually released by ICE agents -- which led to a mother-and-daughter reunion outside the building. Employees who work at the company with legal immigration papers were given green wrist bands to wear. One of those workers was Mathew Varughese, who says he repairs cellphones at CVE. He said when agents arrived, some employees started running. Agents instructed workers to group together by their immigration status. By then, the reactions from employees were mixed — "Standing, no talking. Ladies crying," he said. He said he estimates that about 60% of CVE Technology employees are women. One woman was in the building applying for a job at the same time that ICE agents arrived. She said there were hundreds of people inside. During Wednesday's raid, a group of people gathered with demonstration signs in support of the workers. Messsages on signs included "No human is illegal" and "ICE, stop terrorizing our communities." Buses, at least one of which read LaSalle Corrections Transport, left CVE a few hours after the raid began, presumably with workers inside. Some demonstrators yelled toward one of the buses: "We see you; we love you." ICE staff will interview the Allen workers and make note of "humanitarian situations" such as medical needs, or if a worker is the sole caretaker of another person such as a child, officials said. Either way, ICE says all workers who are illegal "will be fingerprinted and processed for removal from the United States." Family members of workers arrested in the raid may call a 24-hour toll-free detainee locator hotline to get information about detention location and status: 1-888-351-4024. The hotline operates in English and Spanish. CVE has 2,100 employees, making it the third-largest employer in Allen, after Allen ISD and the retail development the Village at Allen and the Village at Fairview, according to the Allen Economic Development Corporation website. In 2014, Samsung accounted for 75% of the company's business, but CVE planned to reduce that significantly as they expanded, according to North Jersey Media Group. The company was honored in 2017 by the U.S. Dept. of Commerce's Minority Business Development Agency with a national award. KERA's Christy Robinson contributed to this report. We are updating this story as new information becomes available. 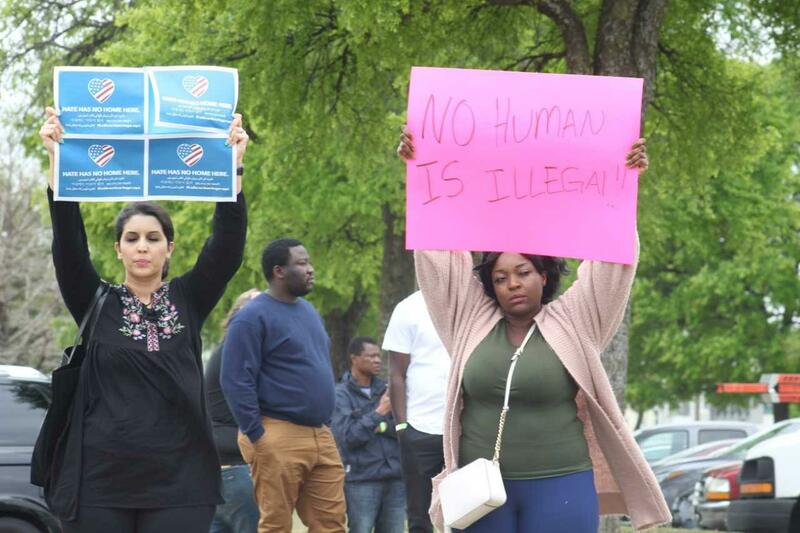 On Friday morning, a group stood outside the Dallas office of U.S. Immigration and Customs Enforcement, waiting for news about their friend, Salvador Hernandez. They were there to fill out paperwork and pay his $2,500 bond. Hernandez was one of the 284 employees of CVE Technology Group arrested by immigration agents in Allen. There were more than four times as many women than men arrested Wednesday in the country's largest immigration raid in 10 years, U.S. Immigration and Customs Enforcement said. The 284 workers came from 15 different countries. With a helicopter hovering overhead, about 200 law enforcement officials descended Wednesday on CVE Technology Group in Allen and detained more than two-thirds of the workers. What will happen to decision-makers at the company remains unclear. The number of asylum-seeking migrants released by Customs and Border Protection grew over the weekend. Hundreds of families arrived at San Antonio’s bus station, and area charities and the City of San Antonio scrambled to provide emergency services. It was an unprecedented humanitarian response. 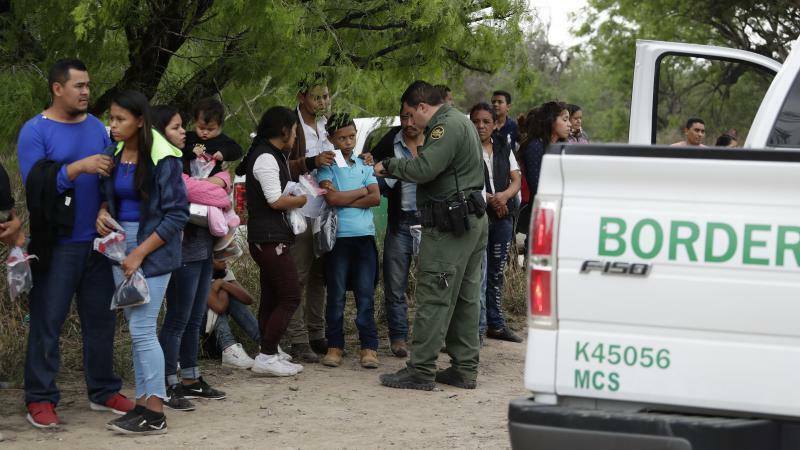 As families seeking asylum continue to be released, the American Civil Liberties Union Border Rights Center and ACLU of Texas are calling for an investigation into the conditions at a temporary U.S. Customs and Border Protection detention facility in El Paso.